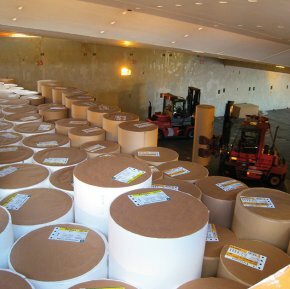 Total European shipments of graphic papers in June 2018 were 2,621,000 tonnes, a decrease of 81,000 tonnes, or -3.0%, compared to June of 2017. Aug. 28, 2018 - EURO-GRAPH, the European Association of Graphic Paper Producers, published its June 2018 statistics of the European Graphic Papers Industry, which showed total shipments of graphic papers in June were 2,621,000 tonnes, up 48,000 tonnes versus the prior month, but down 81,000 tonnes, or -3.0%, compared to June of 2017. In June, total European shipments of Newsprint were 560,000 tonnes compared to 616,000 tonnes in June of 2017, a decrease of 9.1%. Total shipments of SC-Magazine paper in June were 291,000 tonnes compared to 301,000 tonnes in June of 2017, down 3.3%. Total Shipments of Coated Mechanical Reels in June were 504,000 tonnes, up 7.8% versus a June 2017 figure of 468,000 tonnes. Shipments of Uncoated Mechanical papers in June were 199,000 tonnes, nearly flat compared to 199,000 tonnes, (-0.3%) in June of 2017. Total shipments of Coated Woodfree papers in June were 460,000 tonnes, down 12.4% compared to 525,000 tonnes in June 2017. Total shipment of Uncoated Woodfree papers in June were 607,000 tonnes, up 2.2% versus 592,000 tonnes in June 2017. EURO-GRAPH asbl is the European Association of Graphic Paper Producers, which represents the industry sectors of Europe's newsprint, magazine, and fine paper grades. For further information visit: www.euro-graph.org.